The fourth instalment of our 'Bluegrass Meets...' Youtube series! Mr Jeff Kohl's new studio Hotter than Hell Tattoo situated in Edinburgh! (he really didnt want to do it). including 2 new ODB originals and a very special inking session. More than happy to announce the release of our first official DVD! The DVD features our new bass player John (Fingers) Farrell...welcome Sir! 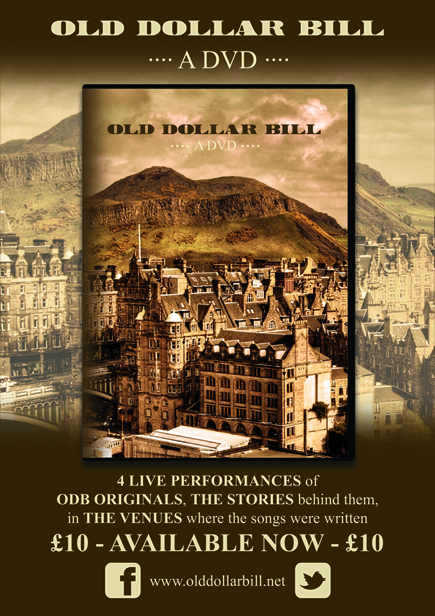 taking place in Edinburgh on Thursday (April 23rd) at 7.30pm prompt!!!! For detailed information check out the 7aheadmusic page link below. The event will last for exactly 30 minutes and we will be playing 4 original songs and being interviewed. We are really looking forward to this and hope you enjoy the show. Hope you can all tune in - lights, camera, sound, action!!! Unleashed Now - The first Official & Exclusive Old Dollar Bill T-Shirt by JFK!!! (head honcho and all around good guy) at Studio XIII Gallery, Edinburgh. *ATTENTION - This is a limited edition offer! !